2019 NASFAA National Conference - Orlando Exhibit Why Sponsor or Exhibit? 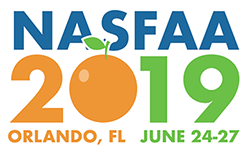 The NASFAA National Conference, which is the largest conference of its kind, features numerous opportunities for exhibitors, sponsors, and advertisers. See for yourself why becoming an exhibitor and/or sponsor at the NASFAA National Conference is the right choice for your company or organization. They represent all sectors of post-secondary education including private and public 2- and 4-year colleges/universities and proprietary schools, in addition to government agencies, guaranty agencies, banks, software providers, and others providing services to the financial aid industry.